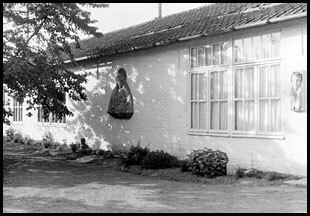 In 1938, thanks to the patronage of Miss Elsa Gevaert (°1902 - †1999), Herman De Cuyper was able to establish himself in his newly built studio dwelling at the Mechelsesteenweg 249 in Blaasveld. The long low house is situated about a hundred metres from a secondary road and is surrounded by a vegetable garden and an orchard. This is how the artist and his family grew: in harmony with nature. From the very beginning, a small exhibition room was integrated in the house. It contained the statues he had made so far. The larger plaster models had their place in the garden. Despite the ravage caused by a V1-bomb at the end of the second World War, a representative amount of sculptures in plaster, stone and wood could be preserved in the parental home. In 1974, his oldest daughter Celestina De Cuyper (°1935 - †2007) conceived the plan to create more room for the substantial oeuvre and to make it accessible for the public. The existing studio dwelling received a new and extensive museum wing. The museum building has an area of 400 m². De Cuyper and his children built it themselves. It wasn’t before 1978 that they could start finishing the interior decoration and soon, the pedestals and sculptures were put in their new location. Yet, the museum would only be opened permanently for the public in 1984, the year of the artist’s 80th birthday. Currently, the family heritage body Museum Herman De Cuyper comprises a collection of a few hundreds sculptures, paintings and drawings.